Howard and I talked not long ago and decided we would meet near Chattanooga, then we would go to North Georgia to fish. When I receive an invite to fish private waters comes around, lets just say, well, it didn't take me long to say yes. Earlier in the week we spoke again. Howard said the temperatures for the day on the water would be in the single digits and asked if I still wanted to go or book another day? Of course I wanted to go and before I could add only if he wanted to go, he said good we are on! This was a to be a "frequent flyer" trip of sorts. I would leave Middle TN late on Thursday, spend the night, and fish in North GA all day, then drive back home that night. We arrived at the motel late Thursday and 6 hours later we were at the local Huddle House for breakfast. On the way to the river the outside temps registered 6 degrees at 7:41 a.m. We were at the river a short time later and soon we were "layered-up" trying to beat the cold. We were on the water and soon drifting nymphs to large fish. The set up would be a couple nymphs with some lead, all hanging under an indicator. The results were, well, real good. Howard was hooked up first and hooked up often. Our guide Andy was spot-on with his choice of flies and a short time later I was fishing to a pig that was resting on the edge of a seam. Howard made sure Andy put me in good spots and I tried my best to take advantage of the hospitality. The morning consisted of dropping the flies in the zone, making a few passes, knocking the ice out of the guides and then hopefully catching a fish before the process knocking ice out of the guides would start all over again. It wasn't so much the ice building in the guides as it was ice building on the line, then getting caught in the guides. Either way it was a constant reminder not to "float your hat". It was lunch before we knew it and after that "one more fish" we were sitting back where we started. When we walked in Abby had an outstanding bowl of hot soup with all the accouterments waiting, along with the heaters on full blast. We warmed quickly and had good conversation, but there were fish to catch and other parts of the river to explore. We packed the hand warmers in our gloves and pockets then we were off for round two. The fish didn't disappoint on the afternoon beats. Howard and I were quickly catching 'em again. We would try different flies. Some flies would produce and those that wouldn't were back in the warmth of the fly boxes. 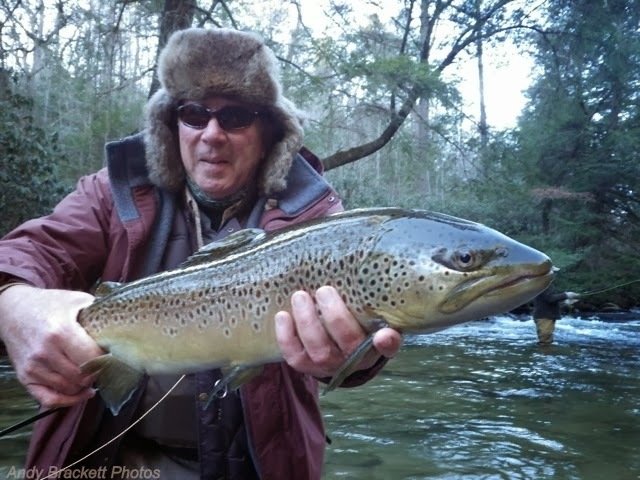 Not to be out done Howard and Andy were dialing-in a big brown. After changing flies a few times Howard came tight on the fish they were stalking. 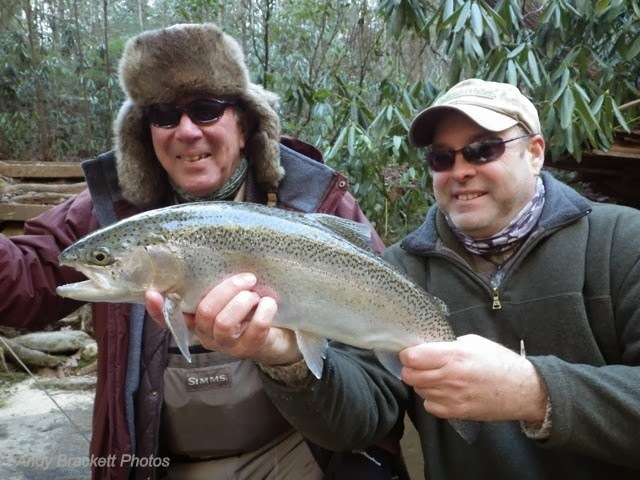 That fish made several hard runs and explored some rocks, but Howard played the fish into some soft water and Andy slipped the net under the largest fish of the day. The brown was a beast that may have been the longest fish in our entire stretch of river. This fish ended our day on the Soque and put a nice cap on the the adventure. Abby and Andy took good care of us throughout our day at Blackhawk. It was great to spend the day with Howard, both of us enjoying a cold but productive day on the river. Thanks to all three of you for a fantastic guides day off. 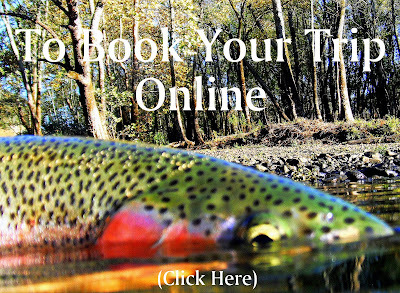 Winter trout trips are upon us and water levels for the most part improving daily. The temperature is hit or miss so some planning with flexibility is best. 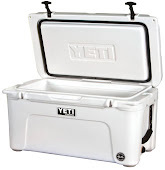 If you want to set up a trip just send an email or call/text 615-796-5143 to get your day on the river. You can see from the photo above things can get a little "squirrelly" on the river at times. Sorry I couldn't resist... Anyway David came back to Tennessee and we did what any angler would do on a free day, we grabbed Brent and went on a musky hunt. The first time we shared the boat chasing musky Brent scored in the first 45 minutes, so we were hopeful. The water was a bit cold and a cold front was coming through Middle TN so we had plenty of excuses if things didn't go our way.We stopped at all the usual addresses and none of the toothy critters were home. Things were looking pretty grim until we had our first follow just before lunchtime. We did things to pass the time like try to get a shot of a turtle in mid-air when it jumped off a log. The photo above was as close as we got on this trip. Then a few minutes later we had a second follow as the sun began to heat up the water. But, that fish spooked at the boat. We continued the long float, now stopping at only likely places. We managed to make up some time in between the follows but still it would be after dark before we made the take-out. As we discussed the take-out we slowed for a likely spot. A few casts into the likely spot we had our 3rd follow of the day. This made us fish even tighter to structure as the sun started moving behind the hills. Then on one cast tight to the bank and in structure a small musky turned on the fly as it hit the water. The take was in plain view and viscious. The fish was hooked good as it ate the fly head first. When the fish made it to the net it was about a 20"+ musky. It was a bit small and the fish got its head through the net and past the gill plate. After removing the fly, the net had to be cut to get the fish through front ways. Then before we could get good photos the fish slid through the net and with a couple kicks of the tail the musky was gone. We still had several miles to the take-out so we put the hammer down, well we rowed fast anyway and made it to the ramp just after dark. When were all loaded up and ready to head for home when we noticed the sky was black and full of stars, So we spent an extra 30 minutes or so taking photos of the stars. Actually taking the photos was one of the coolest parts of the day. It was good to share the boat and the oars with David and Brent again and as we head into the first part of the new year I'm sure we will do it again. Right now the water on the freestones are at a good level and we can chase musky. 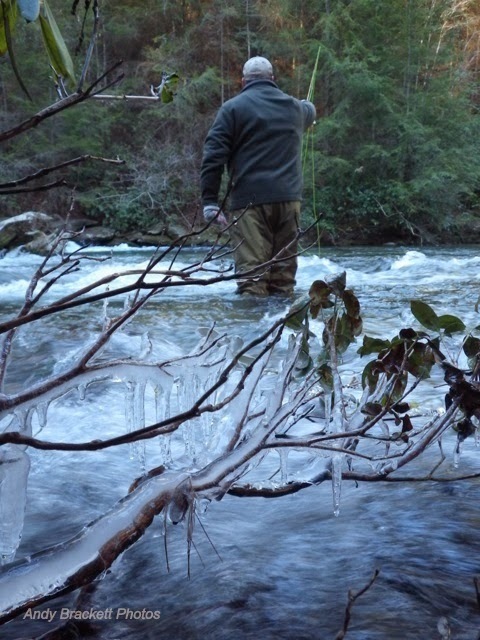 Winter trout trips are upon us. If you want to set up a trip just email or call/text 615-796-5143 to get a day on the Caney Fork, Elk, Holston or Clinch rivers. It feels like Tennessee and most of the South is in the midst of the coldest Winter since forever. It probably isn't that bad but some days I couldn't be convinced. Fish still have to eat and we still need to fish. The water temps are getting lower and probably slowing down the trout's metabolism, making them just a bit more tight lipped. They will chase a streamer and open their mouth for a nymph the bigger the offering the further they will move when the right streamer strikes their fancy. The other day we were on the river with Adam from Coastal Angler, Middle TN and we were floating along when a large fish came out of some super-shallow water. It was a very large brown that was eating a stocker rainbow. Apparently the brown had cornered the little rainbow against the bank and was in the process of eating lunch. A dish of rainbow sushi or something like that.. 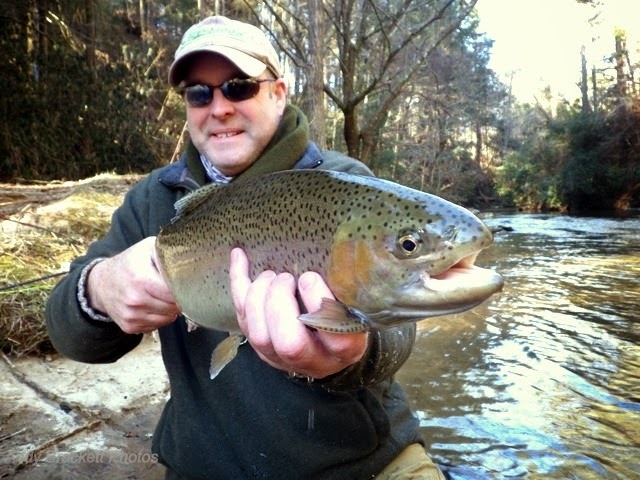 The Elk River: The river is fishing pretty good for Winter and we are picking up fish most all the way through the upper float. There are stockers at the normal access points and if you can find a long enough window in the generation schedule it is a good way to pass the time. Soft hackles and nymphs will work pretty well, but anglers will have to be patient at times. The Christmas Season, New Years, and weather have kept me busy as of late. We have been on the water but the last few days have kept most everyone inside. As you can see from the photo above it was 1 degree this morning which makes fishing, well...miserable. So like everyone else, for the most part anyway, I have been inside tying some flies and catching up on fly fishing shows that come on the TV. The other day we hit the musky waters. We were floating along a bluff and I said hey that spot looks good. Brent threw in and began a steady retrieve back to the boat. I looked down the river and made a correction on the drifter. When I looked back to the fly coming to the boat I looked at 30"+ musky. We toyed with the fish around the back of the boat for a while and then the fish just ghosted down to the bottom of the river. Next we stopped at the Musky Tree and got a hit and run, from a toothy something. But that fish was a bust as well. We spent the rest of the day on three more follows from both medium and long fish. Going back again is on the schedule. 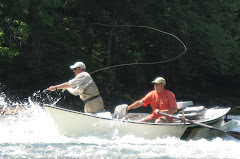 Sunny days on the Caney are producing fish on 2 generators. OK really the river is producing fish on cloudy days as well. The water is in good shape but there is a lot of it. Tossing streamers is a good way to fish right now. Retrieves and sizes are up to the angler. Don't miss an opportunity to float a streamer below an indicator if you get a little lazy. The Elk has also been releasing water throughout the week. However, on the weekends wading anglers get a shot to fish and as of earlier this week TVA is being more angler friendly. The water is a little off color still. Slinging a soft hackle on the falling water will produce. The usual midges and nymphs are also part of the mix on these conditions. If you find a fish feeding on top timing will be everything. Be sure to get the generation schedule and keep an eye on water levels while fishing any tailwater.